New York's Grand Central Terminal is one of the country's largest and busiest public transit structures, and now it has a new website that honors its outsize legacy. Based on the Grand by Design exhibition that was on display at the station last year, the website includes historical documents, videos, stories, and rare, previously unseen photos of the building throughout the years. From its first incarnation as the quaint Grand Central Depot, to pioneering the conversion from steam power to electricity, to its importance as a public space and performance venue, the station has been an ever-adjusting centerpiece to New York City life. The New York Central completed the first phase of electrification in 1906. Here, the line's first electric train stands outside the Grand Central train shed after its first test run from High Bridge on the Harlem River in Northern Manhattan. The drama builds with a story about how Grand Central was almost demolished until its air rights were sold to MetLife, in a controversial move that allowed a massive skyscraper to be built just behind the station (that many say ruined its good looks). Captivating in an entirely different way is the section on the station's future, including what's essentially an entire new station currently being built below Grand Central. The East Side Access project is a seven-mile tunnel that's being bored below Manhattan at this very moment to bring Long Island Railroad trains to the station. There are some lovely construction photos to peruse on the site as well. All images courtesy New York Transit Museum. 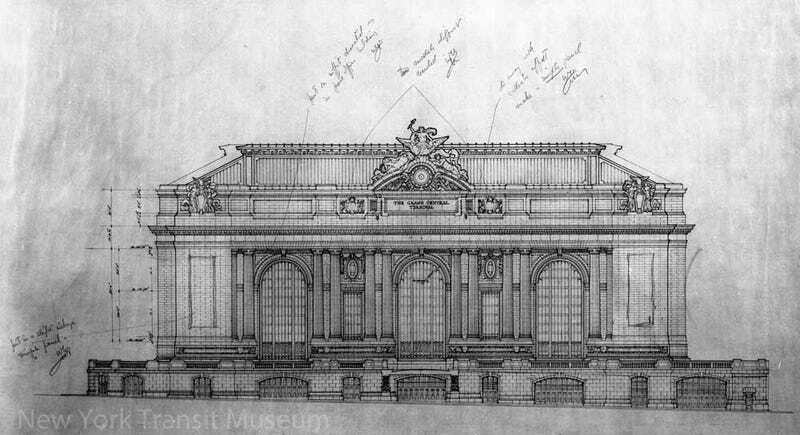 Top image: The final design sketch (with Whitney Warren's handwritten notes) contains elements from both collaborating architects, including Reed & Stem's elevated road and Warren & Wetmore's Beaux-Arts style façade and triumphal arches.